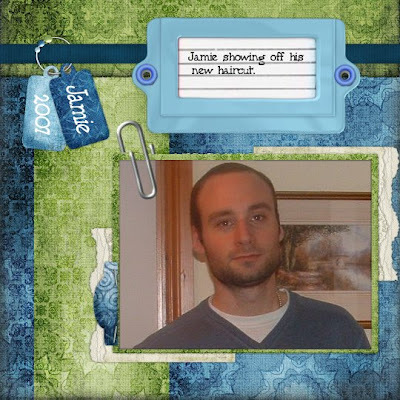 I finally put together a scrap page of Jamie, Hurrah! I do find blokey pages hard to do, you can't do twirly things and flowers, so the page does tend to look a bit plain. But here goes, hope you like it. How cool is Friends Reunited? Today I got in touch with a cousin I haven't seen for nearly 48 years and an old work colleague I worked with over 25 years ago. How marvelous is that? Hopefully I will be able to meet up with Helen my long lost, but not forgotten, workmate over a coffee pretty soon. The news from my cousin was quiet sad, as her life and those of her close family, has been quiet tragic. My cousin's email reminded me that life is not always a bed of roses and I am truly grateful that the little trials I have been through have all been small fry in comparison. I hope to get out into the garden this weekend as everything has shot up and so have the weeds. I took some photographs just before we had this horrible wet week, I'm so glad I did because the rain has knocked the heck out of the plants. I'm going to put together a scrapbook of the photo's as an aide de memoir in my twilight years. Have a great weekend and I'll see you next time. Have a wonderful holiday Vicki, I wish I was going to Portugal. Vicki from AWP tagged me ages ago. Thanks Vicki I’m thrilled. I find it very cathartic to actually put my thoughts into words & pictures. I love art & graphics and blogging is a fab way to display these things. Reading blogs can be inspirational, sometime funny and very often weird! It’s a wonderful way to meet online friends from all over the world. It enables me to indulge in my new passion scrapbooking. Blogging is a great way to showcase your talents and to share what you have learned. 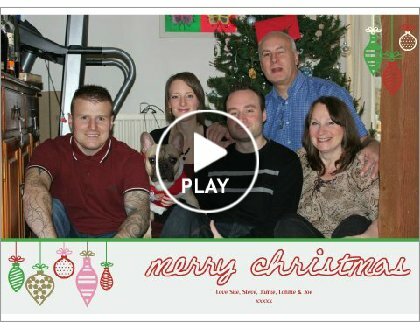 I can keep in touch with my family & friends through my blog. Receiving & giving comments can pick you up when you may be down. It’s so good to have a moan to someone other than your best friend, everyone needs a break from all that ear bashing, don’t they. It is a great way to make a difference. I’ve read things on other blogs that’s made me think twice about my actions. If you read this blog please consider yourself tagged …. I look forward to reading about what it is that inspires you to blog. I'm a Happy Little Bunny .... Big Bunny! I've just had a phone call from Steve my lovely hubby, and he's really happy because the 2nd of his exams at Uni has gone really well. I'm really pleased for him as he really deserves to do well, as he studies so hard. He's also just found out that he does have the day off on Monday so I feel quite happy now. I was Tagged by Vicki from A Work in Progress the other day, I must get around to doing something about it. I forgot all about it until a few moments again, whoops. I'm still feeling awful from this horrible Pericarditis. It's been a couple of weeks and it's getting worse not better. I went to Asda the other day and nearly did myself a mischief! I should have turned back at my garage door because that's when I started to struggle, but I was silly and battled on. Fortunately Jamie and Lonnie were home when I got back home and they unpacked the car and put the shopping away. Revenge is Sweet ... Well Sort Of! Have you ever visited a webpage and wanted to blow it up, spray the whole thing with paint or even cover it in flowers! Well here's a fab site called Netdisaster which lets you do jut this. It's only temporary and there is no actual harm to the site you pick, but it sure beats punching cushions and biting your nails. I'm off to Nuke the Sky TV Guide which as been changed ....... for the worse!! !